Economic data this week from China and Japan, respectively the world’s second and third largest economies, point to the deepening global slump that underlies the turbulence on financial markets. Japan’s economy contracted at an annual rate of 1.4 percent in the fourth quarter of 2015, worse than the expected figure of 1.2 percent. The main reason was a significant fall in consumption spending, which dropped by an annual rate of 3.3 percent for the quarter, reflecting the lack of wages growth. Total wages in Japan have not risen by more than 1 percent for any year since 1997. For the past four years they have fallen in real terms when inflation is taken into account. Public investment was also down, contracting at an annual rate of 10.3 percent. Far from providing a stimulus to the economy, Prime Minister Shinzo Abe’s government is actually imposing austerity. Growth for the full year of 2015 was just 0.4 percent, following zero growth in 2014. 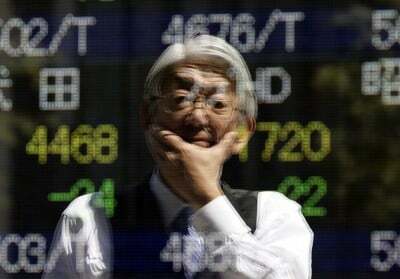 The results have shattered the government’s claims that so-called Abenomics would provide a stimulus to the economy. The announcement of the latest downturn came in the wake of the surprise decision at the end of last month by the Bank of Japan (BoJ) to cut the interest rate on new deposits placed with it to minus 0.1 percent. While the rate cut was not reflected in the output results for the last quarter, it could have an impact on future consumption spending. Economists warn that consumers will not react favourably, viewing the minus rate as evidence of growing economic problems and decide to hold back on spending. Central bankers eschew claims that they are cutting rates to lower the value of the national currency, lest they be accused of engaging in a currency war. Nevertheless, although that was not the stated aim of the rate cut, it was expected that the value of the yen would fall. However, because of increased turbulence in the global financial system, the currency’s value has actually risen since the BoJ announcement. Since the start of the year, the yen has risen by 5.6 percent against the US dollar, eroding the competitiveness of Japanese exports. In anticipation of the poor growth figures, BoJ deputy governor Hiroshi Nakosa called for the government to undertake decisive action to pull the country out of deflation. The main emphasis of his remarks in a speech last weekend was the need to implement so-called structural reforms aimed at scrapping labour market regulations and implementing changes to the pension system. In other words, deepening attacks on the position of the working class, supposedly with the aim of “unlocking” economic growth. The economic news from China was as bad as that from Japan. Exports for January fell by 11.2 percent in year-on-year terms, compared to a forecast 3.6 percent decline, while imports contracted by 18.8 percent. The Chinese trade figures reflected the worsening slowdown around the world. Exports to the US were down by 9.7 percent year-on-year, and those to the European Union fell by 11.9 percent. Exports to Japan and South Korea, China’s two largest trading partners in Asia, fell by 5.3 percent and 15.9 percent respectively. The Chinese slowdown was graphically revealed in figures for imports of two key industry raw materials. Coal imports were down by 9.2 percent year-on-year while the quantity of oil imports dipped by 4.6 percent. The fall in imports overall may have been worse than the official figures indicate. The decline of 7.6 percent in December was likely understated because companies used overcharged invoices for imports as a means for moving money out of the country. The overcharging of imports, by which mainland Chinese companies use a trading partner in Hong Kong to shift out money, is just one aspect of a growing capital flight. The New York Times carried a report last weekend that wealthy Chinese families were trying to move large sums out of the country, fearing that the currency’s value will fall sharply and they will suffer heavy losses of wealth. The article noted that over the past year individuals and companies have moved nearly $1 trillion out of China. Foreign currency reserves, which once stood at $4 trillion, are now down to $3.23 trillion and have declined at the rate of more than $100 billion for each of the past two months. “The swell of outflow is a destabilizing force in China’s slowing economy, threatening to undermine confidence and hurt a banking system that is struggling to deal with a decade-long lending binge,” the report said. The Peoples Bank of China (PBoC) is trying to prevent a rush for the exits. It is using the country’s foreign exchange reserves to prevent a fall in the renminbi. But the continuing rundown in reserves, far from calming the situation, is only adding to concerns that the currency may be heading for a dramatic fall. In a bid to quell the outflow, PBoC deputy governor Zhou Xiaochuan gave an interview to the financial magazine Caixin in which he insisted there was no basis for concerns over the falling value of the renminbi. He dismissed suggestions that authorities would introduce tighter capital controls. “It is normal for foreign reserves to rise and fall as long as the fundamentals face no problems,” he said, adding that it was necessary to distinguish between capital outflow and capital flight. But it is precisely in the “fundamentals” where the problems of the Chinese economy lie. Key sections of industry have significant overcapacity, debt problems are rising and property values, while still rising in major cities, are falling elsewhere. Figures released on Monday showed non-performing loans at Chinese banks rose by 51 percent last year, lifting the bad-loan ratio to 1.67 percent of assets, from 1.25 percent in 2014. The percentage levels might appear small but the amounts involved are huge. According to the McKinsey Global Institute, Chinese indebtedness rose from $7 trillion in 2007 to $28 trillion by the middle of 2014.